This book is the second volume of arrangements for the Celtic harp by Monika Mandelartz. The material encompasses diverse songs and tunes from the British Isles,commonly described as "Celtic Music". This type of music is often associated with the English publisher John Playford. In the 17th century, he published The English Dancing Master, which contains traditional music as well as tunes of his day (up to the Renaissance). 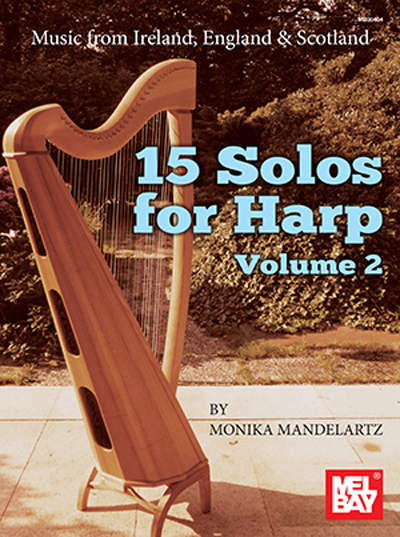 Author Monika Mandelartz, a specialist in historical performance practice, follows Playford's tradition by arranging parts of the collection for Celtic harp. Thereby, Mandelartz points out that her arrangements constitute a "snapshot in time". Her work emphasizes the idea that lively music always allows for change and variation - it must be in order to survive. The book includes tunes such as De`il Take the Wars, Scot Cap(Edinburgh Castle), Upon a Summer's Day, Parson's Farewell, Welcome Home Old Rowland, Dissembling Love (The Lost Heart), An Italian Rant, Porter's Lament,Greenesleeves and Pudding Pies (Greenesleeves and Yellow Lace), Jenny Pluck Pears, Remember Me My Deir, Enfield Common, The Sword Dance, and Drive the Cold Winter Away.